This photograph shows Ray Etzel of Topeka (standing on the left) with two other members of the Marine Corps. 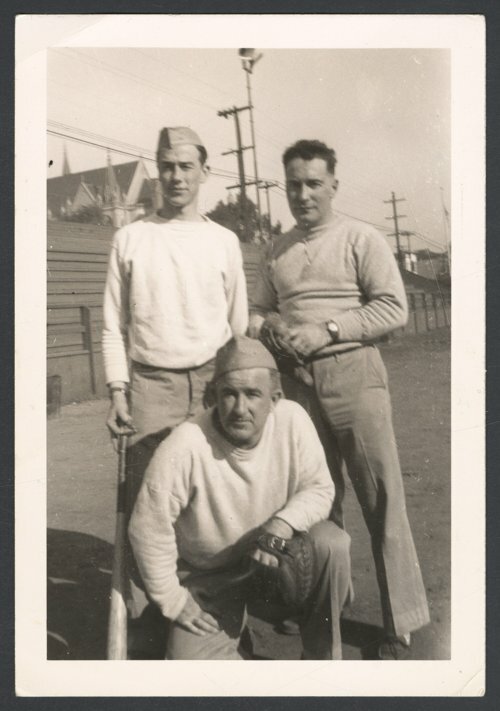 The unidentified men were probably teammates of Etzel's, since the three are posing with baseball gear. Etzel played for the San Francisco Marines Baseball Club while stationed in San Francisco during the final year of his World War II service. He was a member of L Company, 3rd Battalion, 6th Regiment, in the 2nd Marine Division. Following the war, Etzel pitched for the minor league Chanute Owls in 1946, his only season as a professional player. Afterward, he played semi-pro baseball in Topeka and also became active in the Shawnee County Amateur Baseball Association. Ray Etzel was a life-long Topeka resident (1921-2006). He worked for the U.S. Postal Service as a rural mail carrier for 37 years, and later worked for the legislative post office. Digital reproduction of the photograph was accomplished through a joint project sponsored by the Kansas Historical Society and the Shawnee County Baseball Hall of Fame.